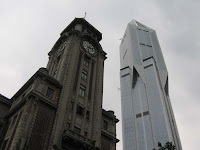 Tomorrow Square in Shanghai, China, houses the J W W Westin hotel. It is situated on the west side of People's Square, and towers high above all the buildings around it. The hotel begins way up on the higher floors of the huge tower. Its lobby overlooks People's Square, offering a view across the river of Pudong. Tomorrow Square is an odd building. It appears, from certain angles, to be narrower at the bottom than at the top. From other angles, it appears narrower at the top than the bottom. This is achieved by a skewing of the rectangluar shaped building about 2/3 of the way up to the top, exactly where the hotel's lobby sits. I am not sure whether I think the building beautiful or not. I have a hard time deciding quite what to think, though it's a question I've asked myself before. It is, however, an interesting building. It makes me think, and it grabs my attention. And it is definitely something worth looking at and visiting. And of course, the quality of the hotel and its service is nothing short of stellar.